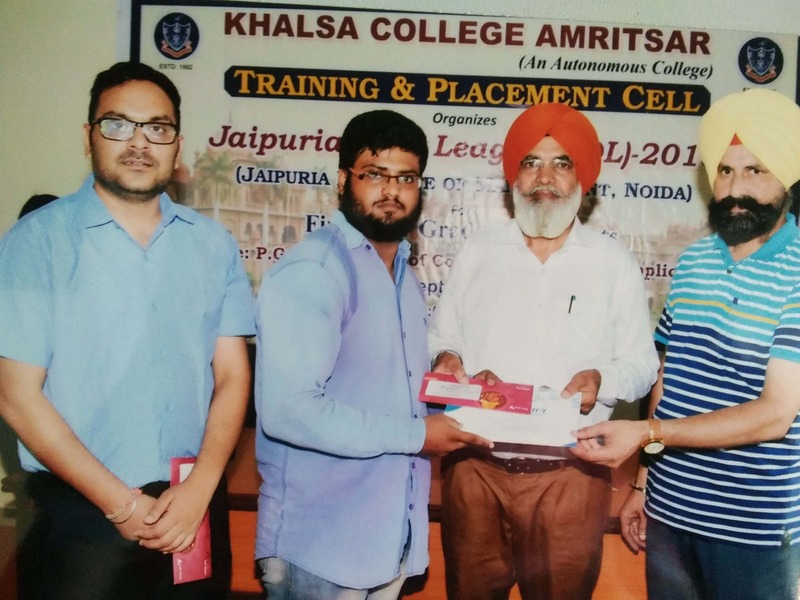 Training and Placement Cell of Khalsa College Amritsar organized a Jaipuria Quiz League (JQL)-2018 for Graduate Streams by Jaipuria Institute of Management, Noida. The quiz was conducted by Mr. Rishi Chadha (Asst. 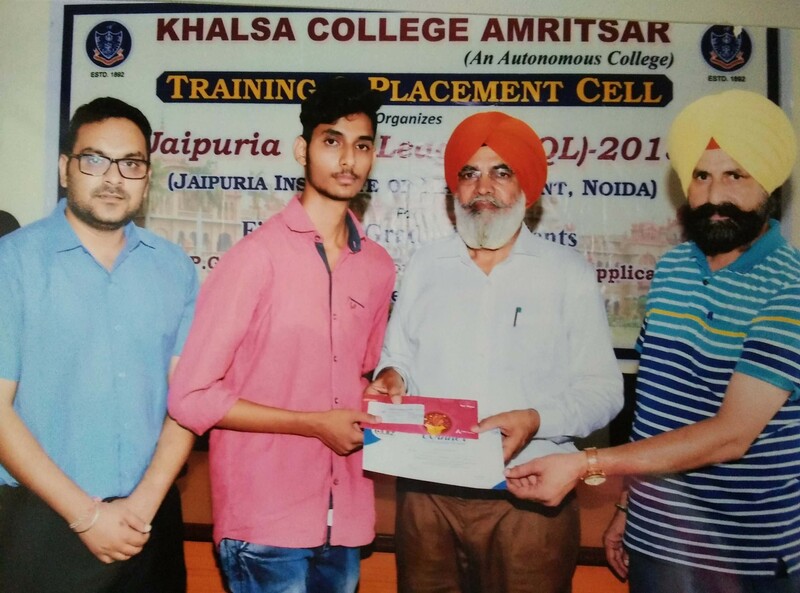 Manager) Jaipuria Institute of Management, Noida & Placement Cell of Khalsa College, Amritsar. 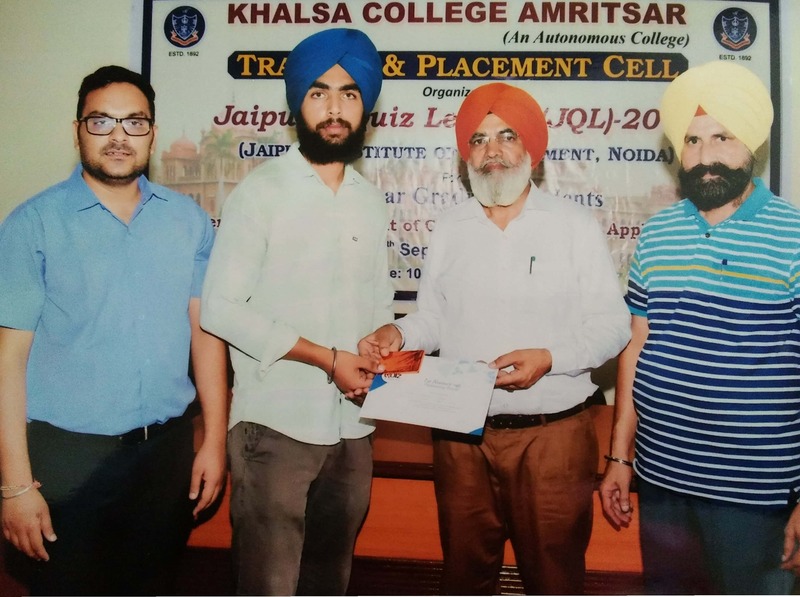 Principal Dr. Mehal Singh, Prof. Harbhajan Singh, Director Training & Placement Cell and Placement Coordinator Prof. Sukhpuneet Kaur welcomed Mr. Rishi Chadha. Principal Dr. Mehal Singh appreciated the efforts of Training & Placement Cell for organizing this event for the students. The purpose of the quiz league was to prepare students for the corporate level and make them able to competitive enough by polishing their mental ability, general awareness & logical reasoning skills. Students learned a lot from this quiz. There are total 70 teams from different departments who have participated in this test series. Dr. Mehal Singh & Prof. Harbhajan Singh give away the prizes to the winning teams and thank all participants for their enthusiastic response to the challenge. Students from B.Sc. 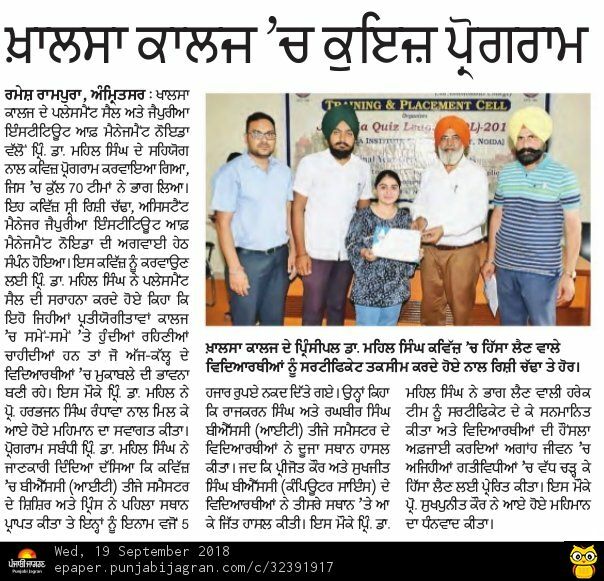 IT Sem IIIrd Shishir & Prince stood Ist and got 5000 rupees as cash award as well students from the same class Raghbir Singh & Rajkaran Singh got IInd prize and Prejot Kaur & Sukhjeet Singh of B.Sc. Comp Sc. Vth Sem got 3rd prize and all participating students receive a certificate. Prof. Sukhpuneet Kaur, Placement Coordinator gave a vote of thanks to the delegates.